The University of Virginia Health System website is the go-to spot for patients and families to find information about doctors, services, locations and health-related topics in their area. Six Feet Up helped UVA Health System launch an all-new site for their Medical Center. The new site is powered by the Plone CMS and aims at organizing information on hundreds of doctors, locations, conditions, treatments and more. In the first quarter of 2010, the University of Virginia Health System launched a new website for consumers and patients of the Medical Center. This online remodel included many improvements and new features designed to put information at visitors' fingertips. 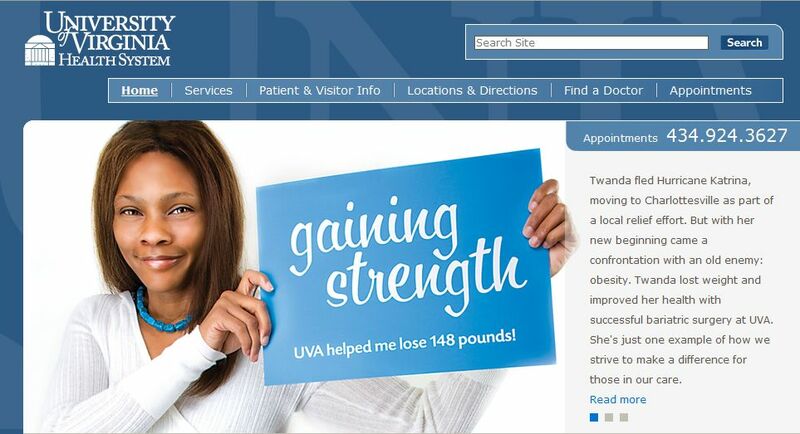 The newly-designed homepage for UVA Health Systems features a promotional area allowing their marketing staff to easily advertise specific services via either a static image or a slideshow. Thanks to Six Feet Up's EasySlideshow, each image and description can be linked to another area of the site or to an external URL. With EasySlideshow, marketers can add and remove images and stories from the homepage with ease and speed. "Find a Doctor": All data on doctors is indexed and searchable, so users can easily find a doctor by typing in keywords such as name, specialty, location, etc. This feature is available on both the homepage and Doctors area of the site. "Locations & Directions": Keyword search on location (e.g., city or street), name, service, etc. to narrow down a list of locations on the map view. "Clinical Trials": Quickly find a clinical trial by searching by condition or disease, doctor's name, or IRB-HSR number. The University of Virginia Health System website also utilizes a faceted navigation system for browsing doctors. This tool allows visitors to narrow down the list of doctors by one or more Specialty, Languages Spoken and/or Gender. Searching for "myocardial infarction" will return documents with keywords like "heart attack"
Searching for "H1N1" will return documents tagged with "flu"
Ranking and Weighting: The number of times a keyword is used in the site is calculated. When compared to the number of documents in the site, the document term frequency is calculated. The larger the document term frequency, the higher the document is ranked within the search results. The "News & Publications" area now highlights information from either the Medical Center site itself or external links. For example, the administrator can link to news articles or publications at the School of Medicine site as well as local pages -- all in the same list. A sub-directory in the "Services" section of the site contains the service "Cancer Center". Admin assigns keyword "Cancer" to this folder. Conditions such as "Breast Cancer" and "Non-Hodgkin's Lymphoma" and treatments such as "Bone marrow transplant" each have the keyword "cancer" assigned to them. This tagging allows these conditions and treatments to automatically appear under the "Cancer Center" service area without manual intervention. When a site editor needs a new keyword added, they can simply request the keyword from the data entry screen. A site administrator is notified that a new keyword is ready for review. The keyword will not be utilized on the site until the administrator approves it. Plone supports importing RSS feeds of content out of the box. In addition, Six Feet Up customized the UVA Health System site to integrate EBSCO medical content libraries using their web services. Content is automatically pulled from EBSCO and managed by the site editors. Six Feet Up customized the EBSCO library content for the University of Virginia's Health System to allow for easy customization of just portions of a single document while still allowing for nightly updates to be obtained and applied to the rest of the content. In addition, the EBSCO integration for the site supports pulling all of the related media, such as images and video for the items from their library. This allows the complete and seamless integration of the contents from an external library so they are served directly from the UVA Health System site. Finding locations has been made easy thanks to integration work with Google maps. All clinics are listed on the left and their location is shown with a pinpoint on the map on the right. Clicking on a clinic pops up more details about the clinic's location. Clicking on the clinic's title in the popup takes the user to the clinic's full detail page with information on hours, directions, parking, and more. When used in conjunction with the "Quick Search", visitors can shorten the list of clinics to the left of the map by searching for a service provided, street name, location title and more. The electronic "get well soon" greeting card feature on the University of Virginia Health System website allows visitors to choose an image from a categorized library of images (such as family, nature, etc.). They can then either select a pre-written greeting or write a custom message for a patient. The system automatically notifies Patient and Guest Services employees that a card is awaiting delivery. The cards are converted to PDF and printed in high quality (400+ dpi) on solid paper stock and delivered to the patient in their room. Six Feet Up put a failover system in place to prevent downtime in the case of a server outage. Site data is replicated using RelStorage, a relational database backend for the ZODB. This allows the use of the replication services built into MySQL to replicate the data across two servers. Search data is replicated using Solr's built-in replication services. The application servers utilize the ifstated tool to verify that master and slave services are running and that all services are replicating across both servers. If one server were to stop responding, the second server is able to take over using ifstated, then become the master. Ease of use for every patient was a key goal for the University of Virginia Health System. It was important that searches return specific results and not require patients to work hard for their information. In addition, with a large number of offices and a large staff, maintaining current information needed to be simple. The new Plone website developed by Six Feet Up successfully accomplish those goals.